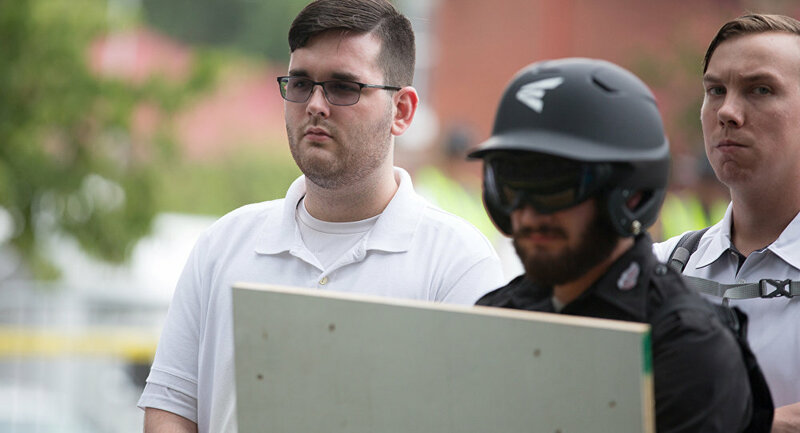 James Alex Fields, 21, drove through a crowd of peaceful protesters, killing one and injuring 19 others. Fields is being charged with a slew of hate crimes. Prior to the "Unite the Right" rally in Charlottesville on August 12, Fields used social media to express "support of the social and racial policies of Adolf Hitler and Nazi-era Germany, including the Holocaust," and other racist views, according to the indictment. Unite the Right was organized by various so-called alt-right groups to oppose the town's vote to remove a statue honoring Confederate General Robert E Lee, an icon from the US Civil War. In photographs of the protest, Fields can be seen carrying a shield with the logo of the neo-Nazi group Vanguard America. On August 11, Fields received a text message from a family member telling him to be careful. He wrote back, "We're not the ones who need to be careful," and attached an image of Adolf Hitler to the SMS, the indictment states. After the August 12 rally was dispersed by police prior to the start time on the permit, protesters from both sides continued to traverse Charlottesville's downtown area. Fields then walked back to his car and started driving around. At the end of a narrow one-way street, Fields encountered a large group of left-wing counterdemonstrators marching together. He idled the car, watched the left-wing group for a bit, then reversed his car. Meanwhile, the group started to make its way through the street where Fields' car was. Fields hit the acceleration pedal, aiming his car directly at the crowd of people who did not share his political views. The car only stopped driving upon collision with another car. Then, he reversed again and fled. Police picked him up a short time later. The impact sent people flying through the air and trapped them between vehicles. The collision was so potent that Heather Heyer, a 32-year-old paralegal, was killed as a result of Fields' actions. Nineteen other people sustained injuries, which ranged in intensity from life-threatening to minor, then-Charlottesville Police Chief Al Thomas said at the time. The officer retired in the wake of the rally amid fierce public criticism of police inaction. The street where Fields attacked and killed Heyer has since been renamed Heather Heyer Way. Heyer's mother spoke to reporters outside US Attorney Thomas Cullen's news conference announcing the charges Wednesday, two months shy of the one year anniversary of her daughter's passing. "She's still my baby girl, even after she's dead. So I wanted to be here to hear what was happening." The US Justice Department charged Fields with 30 counts of hate crimes. He previously faced charges of murder in the first degree on the state level, which typically means that the suspect's killing was premeditated. As a consequence of the state-level charges brought down in January, he faced a potential sentencing length from 20 years to life behind bars. "We remain resolute that hateful ideologies will not have the last word and that their adherents will not get away with violent crimes against those they target," US Attorney General Jeff Sessions said in the Justice Department statement. "Today's indictment should send a clear message to every would-be criminal in America that we aggressively prosecute violent crimes of hate that threaten the core principles of our nation." The accused reportedly showed no signs of remorse as videos of his attack were played. Fields will stand trial of charges levied by Virginia state prosecutors in November.